The Kingdom of Cambodia, formerly known as Kampuchea is a country in South East Asia with a population of over 14 million people.The kingdom's capital and largest city is Phnom Penh. 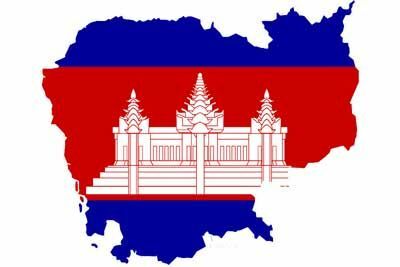 Cambodia is the successor state of the once powerful Hindu and Buddhist Khmer Empire, which ruled most of the Indochinese Peninsula between the 11th and 14th centuries. A citizen of Cambodia is usually identified as "Cambodian" or "Khmer," though the latter strictly refers to ethnic Khmers. Most Cambodians are Theravada Buddhists of Khmer extraction, but the country also has a substantial number of predominantly Muslim Cham, as well as ethnic Chinese, Vietnamese and small animist hill tribes. The country borders Thailand to its west and northwest, Laos to its northeast and Vietnam to its east and southeast. In the south it faces the Gulf of Thailand. The geography of Cambodia is dominated by the Mekong River (colloquial Khmer: Tonle Thom or "the great river") and the Tonlé Sap ("the fresh water lake"), an important source of fish. Agriculture has long been the most important sector of the Cambodian economy, with around 59% of the population relying on agriculture for their livelihood (with rice the principal crop).Garments, tourism, and construction are also important. In 2007, foreign visitors to Angkor Wat numbered more than 4 million.In 2005, oil and natural gas deposits were found beneath Cambodia's territorial waters, and once commercial extraction begins in 2011, the oil revenues could profoundly affect Cambodia's economy.Observers fear much of the revenue could end up in the hands of the political elites if not monitored correctly.